Fort Augustus village is at the southwest end of famed Loch Ness. It was formerly known as Cill Chuimein or Kilchumin, and barracks were built here in 1715. In 1730 General Wade built a new fort and barracks, creating Fort Augustus, which he named after the young son of George II. In 1807 it was bought by Lord Lovat who gave it to Benedictine monks in 1876; they rebuilt it as a great Gothic pile designed by Juseph Aloysius Hansom, of hansom cab fame. Until 1993 the monastery housed a boys’ school and the monastery clused in 1998. The Caledonian Canal passes through the village. 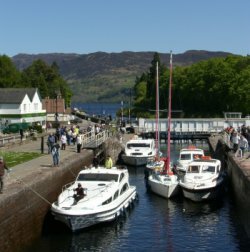 The Caledonian Canal connecting Fort William to Inverness passes through Fort Augustus in a dramatic series of locks stepping down to Loch Ness, Scotland. The Lovat Loch Ness Hotel, Loch Ness, Fort Augustus, Scotland. Find the best deal, compare prices and read what other travelers have to say at TripAdvisor. St Josephs Bed and Breakfast, Fort William Road, Loch Ness, Fort Augustus, Scotland. Find the best deal, compare prices and read what other travelers have to say at TripAdvisor. Caledonian Hotel, Fort William Road, Loch Ness, Fort Augustus, Scotland. Find the best deal, compare prices and read what other travelers have to say at TripAdvisor. Tourist map of the Caledonian Canal featuring the waterway corridor at 1:50,000 showing facilities available to the boat user with details of boatyards, boat hire and boat trip operators. Includes details on the Great Glen Mountain Bike Trail and forest walks. Illustrated guide to canal features of interest. Coverage from Fort William to Fort Augustus. Detailed plan of Fort William at 1:15,000 and an introduction to the canal’s history. Coverage from Fort Augustus through Loch Ness to Inverness. Detailed plans of Fort Augustus and Inverness at 1:15,000 showing streets, shopping areas, waterway facilities and places of interest. Diagrammatic section along the canal and an introduction to Great Glen Forest Walks. Caledonian Canal and the Great Glen (Inland Waterways of Britain) .